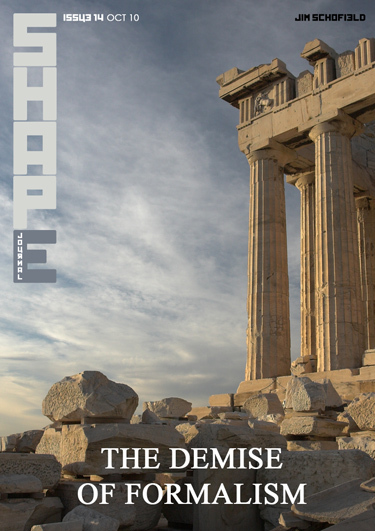 Welcome to Issue 14 of SHAPE Journal. The new paper in this issue is the first in a multi-part series entitled The Demise of Formalism. This is a second version of my paper of the same title written in the mid 1980s, which was then only about Mathematics, and the crises in that discipline precipitated by the work of giants like Gödel and Turing. But, as is turned out, the effects within Mathematics were only the tip of the iceberg and that there was a great deal more in what is a general crisis extending well beyond that limited sphere. The promised paper on Avalanche to Control, which was to be in this Issue has been held back for a couple of Issues to accommodate the above series, but it is ready for publication and will appear soon, probably in Issue 16. Our new policy of regularly producing Reviews on our Blog is finally coming to fruition with the piece on Bennett’s so-called Chaotic Theory of Evolution. Finally, this author was able to write the review quickly enough for it to be still current at the time of publication. In addition, there are several more already lined up for publication, so this will indeed happen at regular intervals from now on.